**Tune in to the live webcast! Ask questions! 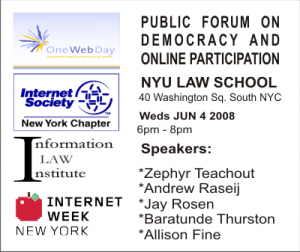 OneWebDay and the Information Law Institute @ NYU, as part of Internet Week NY , this will be a discussion on how technology in general, and the Internet in particular, affects the democratic process. This forum brings together a variety of renowned scholars, thinkers, and activists to provide their perspectives on political engagement on the Net. Join us as we talk about, democracy, politics, and participation online, as we gear up for a politically-minded OneWebDay on September 22, 2008.